Project Drawdown is the most comprehensive plan ever proposed to reverse global warming. Our organization did not make or devise the plan—we found the plan because it already exists. We gathered a qualified and diverse group of researchers from around the world to identify, research, and model the 100 most substantive, existing solutions to address climate change. What was uncovered is a path forward that can roll back global warming within thirty years. It shows that humanity has the means at hand. Nothing new needs to be invented. The solutions are in place and in action. Our work is to accelerate the knowledge and growth of what is possible. We chose the name Drawdown because if we do not name the goal, we are unlikely to achieve it. 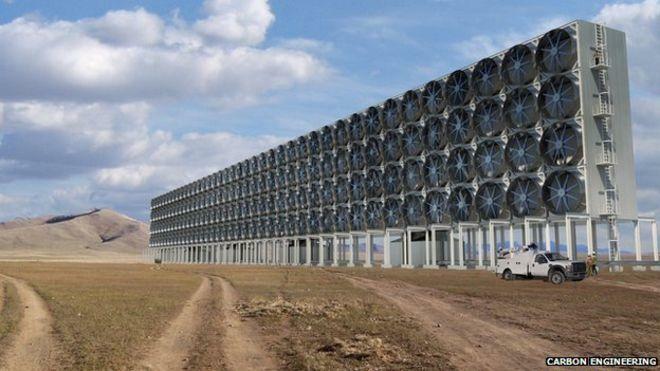 This is a carbon capture unit created by Global Thermostat. It uses amine-based chemical sorbents bonded to porous honeycomb ceramics that together act as carbon sponges, efficiently adsorbing carbon dioxide directly from the atmosphere or smokestacks. The captured carbon dioxide is stripped off and collected using low-temperature steam. The output is 98 percent pure carbon dioxide at standard temperature and pressure. Nothing but steam and electricity is consumed, and no other effluents or emissions are created. The entire process is mild, safe, and carbon negative. For hundreds of millions of years, plants have been harnessing the power of photosynthesis to capture carbon dioxide from air and transform it into biomass. Recently, humans have attempted to engineer a similar feat through direct air capture (DAC) systems. The long-term hope: To use DAC to help achieve and maintain drawdown. DAC machines act like a two-in-one chemical sieve and sponge. Ambient air passes over a solid or liquid substance; its carbon dioxide binds with chemicals in the substance that are selectively “sticky,” while other gases in the air are free to go. Once those capture chemicals become fully saturated with carbon dioxide, energy is used to release the molecules in a purified form. The fundamental challenge is showing that DAC can be done efficiently and cost effectively. In the near term, the purified carbon dioxide released from DAC units could be used in a wide range of manufacturing applications from synthetic transportation fuels to the creation of plastics, cement, and carbon fiber. Others are looking to use atmospheric carbon dioxide in greenhouses to improve indoor agricultural yields. Eventually, DAC could help clean up carbon dioxide from the atmosphere as a sequestration technology.